Since ancient times, the Sun has been an object viewed with the deepest fascination. Its intimate link with the changing seasons, and its life-giving properties as the source of energy for the Earth mean that it has always played a central role in mankind’s attempts to understand how the Universe works. We now have a fairly good understanding of the basic properties of a star like the Sun. We know that it is a massive ball of gas, weighing some 300,000 times as much as the Earth, and consisting mostly of hydrogen. The temperature in its core (around 15 million degrees centigrade) is high enough to fuse hydrogen into helium, as in a hydrogen bomb. Although this hydrogen fuel is being burned up at a rate of millions of tonnes per second, the Sun is so massive that it will keep generating energy in this way for another five billion years. The energy released through this process escapes very slowly from the hot dense centre, taking millions of years to reach the outer “photosphere,” where the temperature is only around 4000 degrees centigrade. From here, most of the energy finally escapes the Sun as the optical light that we see. Although this basic picture of the Sun as a star is almost certainly correct, it is definitely not the whole story. Because of our proximity to it, a mere 150 million kilometres away, we can make observations of the Sun that are impossible for any other star, so it provides an invaluable “laboratory” for studying the detailed properties of stars. 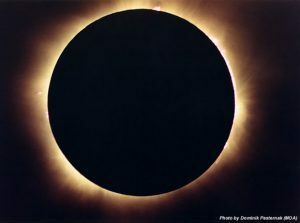 Through observations during eclipses, the corona has been known about for at least three thousand years – a Babylonian description of an eclipse in 1063 BC describes it as “a fire in the heavens.” However, despite all this study, much about the corona remains obscure. One of the early mysteries about the corona came from studies of its spectrum. In the 19th century, astronomers started using spectrographs to split the light from the corona into its constituent colours. These studies revealed strong emission at a particular colour of green (at a wavelength of 530.3nm). Such emission lines were known to be produced by different chemical elements, but none generated emission at exactly this wavelength, so the origins of this light remained a mystery. It was even suggested that this light might be produced by a completely new element, dubbed “coronium” in honour of its place of discovery. The truth was only uncovered in 1939, when it was realized that this emission was being produced by ordinary iron atoms which have had most of their electrons stripped away. The difficulty with this interpretation is that it is only possible to strip the electrons from iron at very high temperatures – to produce this emission, the corona must be at a temperature in excess of a million degrees centigrade. Thus, this discovery does not fit with the conventional picture of a star in which the temperature drops steadily as one goes out from the nuclear burning core to the outermost envelope. Once it was recognized that the corona is very hot, it was realized that most of the light it emits would be produced in the extreme ultraviolet and X-ray parts of the spectrum. Since light at these wavelengths does not get through the Earth’s atmosphere, it was only when we started putting telescopes in space that it became possible to study this emission in any detail. The first major observations were made from the Skylab space station in the 1970s, but the field has been revolutionized in the last few years by the amazing image quality that the current generation of satellite telescopes has produced. As the picture above shows, the corona contains a wealth of fine-scale structure in the form of filaments and loops, and the arrangement of these features varies significantly from day to day. Studies of the magnetic field around the Sun reveal the origins of these structures: the charged particles that make up the hot “plasma” in the corona become stuck to the magnetic field lines, delineating their arrangement much like iron filings around a bar magnet. However, as is clear from the complexity of the features, the magnetic field around the Sun is a lot more complicated than that of a bar magnet. The Sun’s magnetic field interacts with the coronal plasma, and it is probable that these energetic interactions are responsible for heating the corona to the very high temperatures observed, although the details of the heating process are still poorly understood. Thus, to understand the structure of the Sun, and hence stars in general, one must study this magnetic field in some detail. Of more immediate concern to humans, where there are “open field lines” directed out into space, energetic charged particles are thrown out from the Sun along the field lines; if pointed toward Earth, these particles can endanger astronauts and even knock out satellites (as well as producing the beautiful auroral displays of the Northern and Southern Lights). 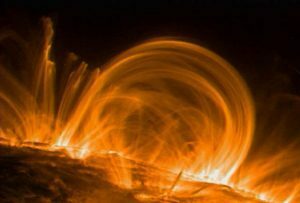 These dangers have meant that sophisticated computer programs have been written to model the three dimensional structure of the Sun’s magnetic fields.